ATM: Out of the Hunt. So Now What? The Chicago Bears won’t be signing Kareem Hunt. The great debate ended before the offseason officially began, as the former Kansas City Chiefs running back, facing disciplinary action from the league for a history of violent behavior, signed with the Browns. Time will tell if he’s worth the trouble for Cleveland, but the Bears still need to add some explosiveness to their backfield if they hope to improve their run game. Because while Jordan Howard is a good player, the Bears simply need more. Forget for a second his sub-4.0 yards per carry number. The Bears offense just didn’t function well with him on the field. According to NFGSIS, the team averaged 4.78 yards per play in the five most frequently used lineups in which Howard was used. In the five most-used lineups that didn’t include Howard, they averaged 6.8 yards per play. The big difference came in the passing game, where they averaged 7 yards per pass play without Howard and 4.92 with him. Matt Nagy seems to know it too. In the playoff game he used a formation with three wide receivers, one tight end and Cohen over Howard 21 times. Their next most-used formation was used five times, that also didn’t have Howard in it. Howard played just 22 snaps — 34% of the team’s total — against the Eagles. From a football perspective, signing Hunt would’ve been the easy move, but not one the Bears could make without knowing his availability. Now, they have to figure out something else. Personnel moves are not going to tell the story of the 2019 Bears. They could improve their roster this off-season, be a better team than they were in 2018 and STILL win fewer than twelve games. No, with lofty expectations for the coming year, everything will depend upon the improved play of their starting quarterback, Mitch Trubisky. According to Nagy, his young QB has already conquered the “next play mentality” and “the steps of 101 progressions.” In layman’s terms, Trubisky knows what he is doing when it comes to running the offense. But it’s understanding what the opposing defense is up to that comes next, or as Nagy puts it, “recognizing pre-snap what he’s about to see from these defenses.” At quarterback, if you know what your 11 are doing, and you know what their 11 are doing, it just comes down to making the plays. And Trubisky can make ALL the plays. Look no further than those final drives against the Eagles. Season on the line. Avoiding the rush. Hitting targets deep down the field with pin-point accuracy. Every completion was met with elation from the crowd. Everyone in that building felt something was changing because something was changing. Sometimes the best moves are the most difficult. The biggest no-brainer of this 2019 NFL offseason is for the Bears to sign Kareem Hunt. From a strictly football standpoint, Hunt must be their top target. But, of course, it’s about more than strictly football. Those arguments were made by Jeff here and Emily here. The team that won the rushing battle went 9-2. The two exceptions of course were the Chicago Cody Parkeys losing to the Philadelphia Eagles and the Los Angeles Chargers beating the Baltimore Ravens, despite losing the rushing battle by a single yard. Teams that ran for 100 yards went 8-1. The only team that lost was Houston, which gave up 200 to Indianapolis in the Wild Card round. Television networks and league executives want the NFL to be a passing league, but it’s tried and true that running the ball is important and the Bears just weren’t good enough at it. Despite being 11th in rushing yardage, the Bears struggled to move the ball on the ground consistently throughout the year. They were 27th in yards per carry and all of their rushing totals were inflated by having a quarterback who could routinely run for 15 yards on 3rd-and-10. Perhaps what’s most troubling about the Bears lack of run production is that, unlike 2017, opponents weren’t trying to stop the run. Jordan Howard faced a stacked box (eight or more defenders) on just 14% of his carries, according to NFL NextGen Stats. That’s the 13th-lowest mark in the league. The player who had a stacked box the least was Tarik Cohen, coming in at 5.05%, well below Wendell Smallwood’s 6.9% rate. As the New England Patriots prepare to play in their 79th Super Bowl of the Tom Brady and Bill Belichick era, they serve as the sport’s finest example of what the Bears – and every other organization – are trying to accomplish. We can talk about Chuck Pagano, Khalil Mack, future first-round picks, draft steals and everything else, but what this era of Bears football becomes depends almost entirely on the quality of the head coach and the quarterback. And the first year got off to an adequate start for Matt Nagy and Mitch Trubisky. The Bears were a top ten offense in both points per drive and DVOA until the QB was injured. Then they slid back. They struggled for most of the playoff game, but the quarterback made enough big plays to give them a chance to win. Then Ray Finkle blew it. Despite what Lt. Lois Einhorn did with those uprights, the Bears coach and QB gave us hope for the future. Hope that this thing could be special. Chicago’s defense was awesome in 2018, leading the NFL in points allowed, turnovers forced, touchdowns scored, and passer rating against. They also finished third in yards and sacks and were generally the best defense in the NFL by a wide margin. Their play propelled the Bears to a 12-4 finish, NFC North title, and the franchise’s first playoff berth in eight years. It’s hard to expect much improvement from that unit in 2019. In fact, they’re almost certainly not going to repeat that level of dominance. So when I write that I expect the Bears to improve in 2019 and be one of the top Super Bowl contenders, that must mean I expect it to happen because of the offense. 20th in Football Outsiders’ DVOA rankings, an all-encompassing metric intended to evaluate an entire unit. Outside of points per game – which was likely aided by all the turnovers and defensive touchdowns – the offense was pretty consistently below average in most important metrics. So why am I so confident the offense will improve next year, even though they probably won’t be making many significant personnel changes? To put it simply: NFL history strongly suggests that significant improvement is coming. The hiring of Chuck Pagano to replace Vic Fangio confirmed one thing: this is Matt Nagy’s team. The Bears won in 2018 because of their defense, first and foremost. It was a defense and coordinator Nagy inherited. When Fangio left, it would’ve been easy to go with the continuity candidate Ed Donatell. But Nagy took a chance, bringing in someone from the outside, someone who more represents Nagy’s style. There is no measure that tells us if being aggressive is better than being conservative defensively, but there’s no question that Fangio was on the conservative end and Pagano fits Nagy’s aggressive mentality. During the end of the season presser, Nagy described Pagano as having an “attacking style” before saying again that Pagano is aggressive. Pagano’s lone season as a defensive coordinator, in 2011 with the Baltimore Ravens, represents that. Pagano’s Ravens sacked opposing quarterbacks on 8.2 percent of their drop backs, even better than the 2018 Bears’ rate of 7.5. Opposing quarterbacks finished with a passer rating of 68.8, throwing for just 11 touchdowns and 15 interceptions, all numbers comparable to the 2018 Bears. Nobody should expect to hear Pace or Nagy address Cody Parkey’s future or the Today Show appearance. But both questions must be asked. What absolutely cannot be said today is “Parkey is our kicker next season.” This organization can no longer show blind, ignorant loyalty to an inadequate player. It’ll be interesting to hear how each man discusses Chuck Pagano’s addition. I suspect neither was thrilled with the game Vic Fangio called against the Eagles so it won’t be surprising for them to signal what Pagano will change on that side of the ball. The Kareem Hunt conversation is going to get started soon enough. Wonder if it is today. Reclamation projects are very possible in this league (See: Hill, Tyreek) and it is unlikely Hunt won’t be in the NFL next season. Unlike Ray Rice – whose career was already essentially over at the time of his incident – Hunt will only be 25 years old when the 2019 season kicks off. The tone was established with Pace’s opening remarks. “Proud of what we accomplished but not satisfied” and “stay on the right track” were clearly what the GM wanted to communicate. Pagano. Pace made it clear the hiring was made by Nagy, not him. Nagy used the two words I expected to here: attacking and aggressive. Parkey was brought up almost immediately. Two things: (1) Pace sounded like Parkey was going somewhere else. (2) Nagy said Parkey didn’t mention Today Show appearance in their exit interview, and seemed displeased with the whole ordeal. He made it clear it was a “me” gesture not a “we” one. Parkey is gone. The Bears’ 2018 season ended with a doink a few weeks before anybody wanted it to, but man oh man what fun it was. After four straight years of shifting attention to the draft by November, the Bears went 12-4, established themselves as one of the best teams in the NFL, and laid waste to the division. Along the way, they got to officially end the season of both the Packers and Vikings and made the entire city of Chicago go crazy with football fever. After three brutal games to start the season, Mitchell Trubisky finally had his coming out party when he laid waste to the Bucs in week 4. Just to make sure you knew it wasn’t a fluke, he followed it up with 300 yards and multiple touchdowns in both of the next two games. Khalil Mack, Eddie Goldman, and company embarrassed the Rams on Sunday Night football with the whole world watching (and picking against Chicago), proving once and for all that this team was in fact for real. Eddie Jackson just kept scoring touchdowns, Kyle Fuller led the NFL in interceptions, and the defense as a whole made big play after big play. Linemen and linebackers kept scoring touchdowns on trick plays, just for fun. The Bears finished the season winning 9 of their last 10 games, with the only loss coming on the road in overtime with their backup QB. The Bears finished with the NFL’s 3rd best W/L record, 4th best point differential, and 3rd best turnover differential, all key indicators of the best teams in the league. This is the moment. Are you ready? Why Do I Like the Chicago Bears This Week? …and the champagne is on ice at Josie Woods Pub. There are few occasions that warrant excessive celebration in the basement bar I’ve called home for eighteen years. Beating the Packers to win the NFC North would absolutely be one of them. And I expect the Bears to deliver. They have earned this stage. And the lights that shine on it. Why the Bears Will Win. Soldier Field. I mean, I wrote an entire piece on this topic a few days ago. Just go ahead and read that. If you don’t want to read it, here are the CliffsNotes™: the Chicago Bears have become a dominant team at home in 2018. Pass Rush. Aaron Rodgers has been sacked 41 times, and hit a lot more than that. He’ll be playing Sunday with about 40% of his starting offensive line. I expect an angry performance from Khalil Mack, Akiem Hicks and the rest of the Bears front. They know that if they give Rodgers time in the pocket, he’ll find holes in the secondary. Expect them to hit the Green Bay quarterback and hit him often. Run Run Rudolph! Green Bay is one of the league’s weakest run defenses and the Bears are starting to find their identity on the ground as they make their playoff push. 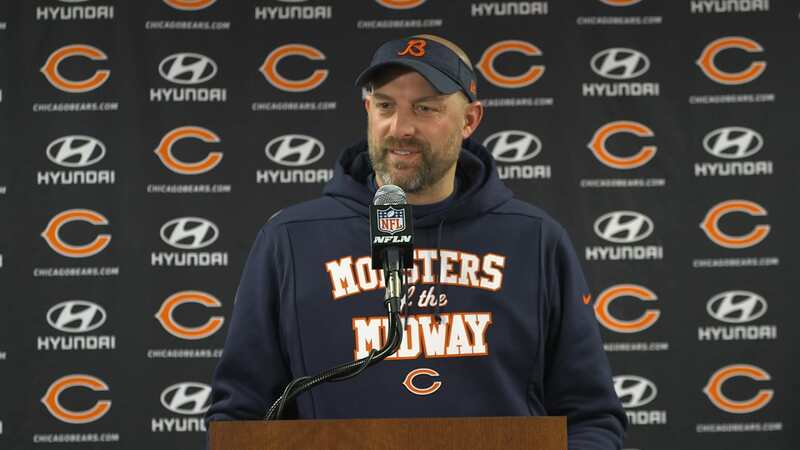 This is not a game Matt Nagy is going to ask Mitch Trubisky to win by throwing it 40+ times. This is game Nagy is going to win by controlling the line of scrimmage and keeping Aaron Rodgers on the sideline. They’ll throw it effectively. But the run game will dominant. Rodgers. The Bears have 25 interceptions. Aaron Rodgers has thrown 1 all season. Something’s gotta give, right? And historically it gives in the Green Bay quarterback’s favor. (See: Fuller, Kyle’s only negative plays of this entire season.) A question that may arise on Sunday is will Rodgers pick on Sherrick McManis, filling in for the injured Bryce Callahan? Don’t be surprised to see a bunch of targets for Randall Cobb from the slot. Trubisky. The quarterback was awful Sunday night against the Rams and that was without much pressure. The Packers can put together a pass rush and one would expect Mike Pettine to dial-up blitzes Trubisky hasn’t seen to try and force hurried decisions. Trubisky’s development is still ongoing, even if the rest of the team is on a different plateau now. He’s going to have bad games. But he can’t stack bad games if this team has serious aspirations for January. Specials. Other than Tarik Cohen on punt returns, I don’t trust a single piece of the “third phase”. Not the punter, even off his best outing in years. Not the coverage units, especially with McManis moving into a starting role on the defense. Certainly not the kicker, who is the team’s most substantial liability down the stretch. The Bears need to do a lot of work here in the offseason. But that won’t help them Sunday.